Red Bull is stepping up their music game and venturing in to new territory! 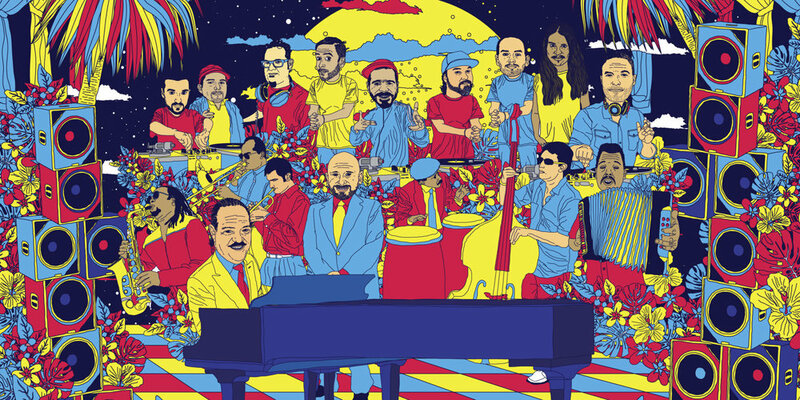 This weekend the Red Bull Music Academy is celebrating Latin Music with a line-up of events including musical performances, studio collaborations and lectures by leading industry professionals. From Thursday, October 16th through Saturday, October 18th, Red Bull Siempre Fresco will celebrate nu-Latin electronic music and its history, bringing together producers, DJs, and influencers in Latin Music. This new musical endeavor will kick off in Miami and aims to bring together traditional Latin sounds with modern Latin beats that have been a big influence in the electronic music scene. Siempre Fresca will bring unite artists from around the nation. including salsa legend Larry Harlow and nu-Latin DJ collectives Moombahton Massive (Nadastrom+Sabo), Que Bajo (Geko Jones+Uproot Andy), Peligrosa (DJ Orion+El Dusty+DJ Manny) and Electrópico (Mr Pauer). As part of the Siempre Fresca weekend the DJ Collectives and Larry Harlow will have a studio recording session working on compositions created specifically for Red Bull Siempre Fresco. The studio time is not open to the public, but the collaboration will be on display as Harlow, accompanied by Marlow Rosado y La Riqueña, take the stage at Grand Central on Saturday alongside the four DJ crews. Larry Harlow is a legend in the music industry and has worked with artists such as the Queen of Salsa Celia Cruz, the Mars Volta, part of the group Fania All-Stars and was awarded the Latin Grammy Lifetime Achievement Award in 2008. His blend of Afro-Cuban and jazz sounds on the piano made him a musical sensation that transcends generations and music genres and that’s what Siempre Fresca is all about. Blurring the lines through music. More and more Latin sounds are being incorporated into some of the hottest music of today and this event hopes to bring both young and old to appreciate the sounds of salsa, cumbia, merengue and more that have made their way in to mainstream beats. The three day event will lead up to the LA MUSA AWARDS where Marlow Rosado is being honored by the Latin Songwriters Hall of Fame during the LA MUSA AWARDS on Oct. 18 in Miami Beach. Make sure to check out the list of events happening around town. Some of the events are free but space is limited, make sure to RSVP and early arrival is suggested. Feel the rhythm this week with Red Bull Siempre Fresca! Do you mind if I quote a few of your posts as long as I provide credit and sources back to your site? My website is in the exact same area of interest as yours and my users would definitely benefit from a lot of the information you present here. Please let me know if this okay with you. Regards! Feel free to share and thanks for the love! Have a fab week! Woah! I’m really loving the template/theme of this site. It’s simple, yet effective. A lot of times it’s tough to get that “perfect balance” between user friendliness and visual appearance. I must say that you’ve done a great job with this. Additionally, the blog loads very fast for me on Internet explorer. Outstanding Blog! Thank you! Truly appreciate it! Stay tuned, there’s so much more coming!